1 Palestinian medic rushes to a a protester who got shot in his mouth by teargas canister fired by Israeli troops near the Gaza Strip's border with Israel, east of Khan Younis, in the Gaza Strip. 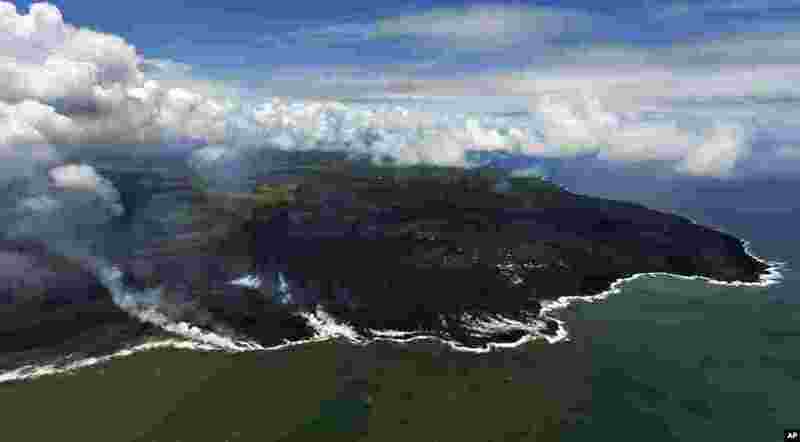 2 Most of the Kapoho area including the tide pools is now covered in fresh lava with few properties still intact as the Kilauea Volcano lower east rift zone eruption continues in Pahoa, Hawaii. 3 Prime Minister of Canada Justin Trudeau (C-R) and his wife Sophie Gregoire Trudeau (R) welcome French President Emmanuel Macron (C-L) and his wife Brigitte Macron in La Malbaie, Quebec, Canada, on the first day of the G7 Summit. 4 Members of the Washington Capitals pose with the Stanley Cup after the Capitals defeated the Golden Knights 4-3 in Game 5 of the NHL hockey Stanley Cup Finals, June 7, 2018, in Las Vegas.